This is an extension of an earlier post that has had a few "clicks" lately. I was following someone who was using the letters of the alphabet to create posts using 3 words that begin with that letter. This post was for the letter "X." I have extended the post with a fictional account of the owner. "Now I can imagine, since I have seen her emerge from the car on one occasion, that she was very beautiful at one time. She has retained her slim figure, but the glow of her skin has faded. Her hair has thinned and that once effortless walk, is now more awkward. I she may have been an executive for a cosmetic company, where image is everything. What of her image now, maybe it's just the car - striking in shape and colour, though a little worn. She still drives and gets out every Saturday morning to the organic market. Maybe the cosmetics she once wore were laced with chemicals and she is now paying the price. I wonder, whom she feeds at home, with this purest of pure bounty. Does she care for an ageing partner, or does she live alone. I wonder too, if she has children or friends. But, why has she kept the car? Was it a gift? 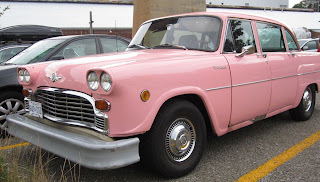 Who gives a beautiful woman a gift of a pink taxi cab? Perhaps there is no money now for a new one. Then again, if everything she ever was, is summed up in that car, why would she ever part with it?"